Bedmi Puri is a favourite street food of Delhi, Agra, Mathura. 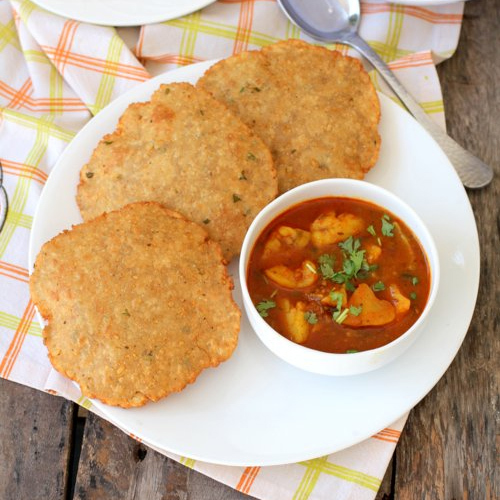 Soft and crispy Bedmi Puri makes a great combination when served with Aloo Masala and Suji Halwa. Wheat Flour -Â 400 gms (2 cup), Sooji - 100 gms (1/2 cup), Oil - 2 table spoon. Moong or Urad dal - 20 gms (1 cup), Salt - 1 tea spoon (according to the taste), Coriander powder - 1 1/2 tea spoon, Red chilli powder - less than 1/4 tea spoon, Garam masala - less than 1/4 tea spoon, Green Chilli - 2, Ginger - 1 inch long piece, Oil - to fry Bedmi Poori. Soak the moong or urad dal in the water for 2 hours. Strain the water and put it into the mixer along with ginger and green chilli. Make a paste of it and do not make it too thin. Add salt, coriander powder, red chilli powder, and garam masala into the paste. Sieve the flour and sooji in a separate bowl. Put oil and dal masala paste in to the flour and knead it with luke warm water. The dough should be tight as compared to the dough prepared for the plain chapatis. Cover the dough and leave it for half an hour. After half an hour fix the dough by beating it with greased hands. Heat oil in a pan. Make small balls of the dough and roll them into a flat disc of 3-4 inch each. Put the pooris into pan and fry them by flipping and turning the sides, till each of them turns brown. Fry all the other pooris in the same manner. Your Bedmi pooris are ready. Serve them with Aloo Masala Curry recipe.